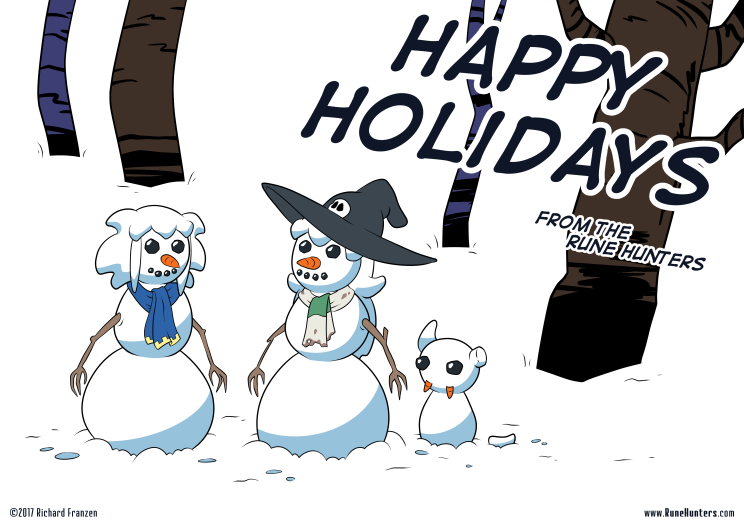 Another years draws a close, and the Rune Hunters have built some snowmen while they’re off enjoying some hot cocoa (and in Alexis’s case, some whiskey in hers). And yes, if you’re wondering, the art style in this one is an homage to the winter comics from the classic Calvin and Hobbes. Happy Holidays. I cannot recall if I asked this, but you going to be at ChibiChibi again this year? I’ll be there again. I ask because you did not look super happy to be there when I saw you last time. To be fair, I could have been reading into things. They did put you in the back corner. I do plan to be there again this year, if I make it on the sign up sheet. I did enjoy it, I hope I didn’t come across as upset. I may have just been tired at the point when you came by. I’ll try to give a heads up on the site/Facebook page if I make it again this year. If so, hopefully you come by and say hi. I’ve had a year to prepare better and should hopefully have a better booth this year, so I am excited for it. Let me know if you need to borrow a folding table or a rack. I should be good, but thanks for the offer.